Raigad is a hill fortress situated near Mahad, Raigad district of Maharashtra.It was the capital of the most illustrious Maratha sovereign, nurtured by Chatrapati Shivaji Maharaj. The fort, which rises above 820 metres (2,700 ft) above sea level, is located in the Sahyadri range. There are approximately 1737 steps leading to the fort. 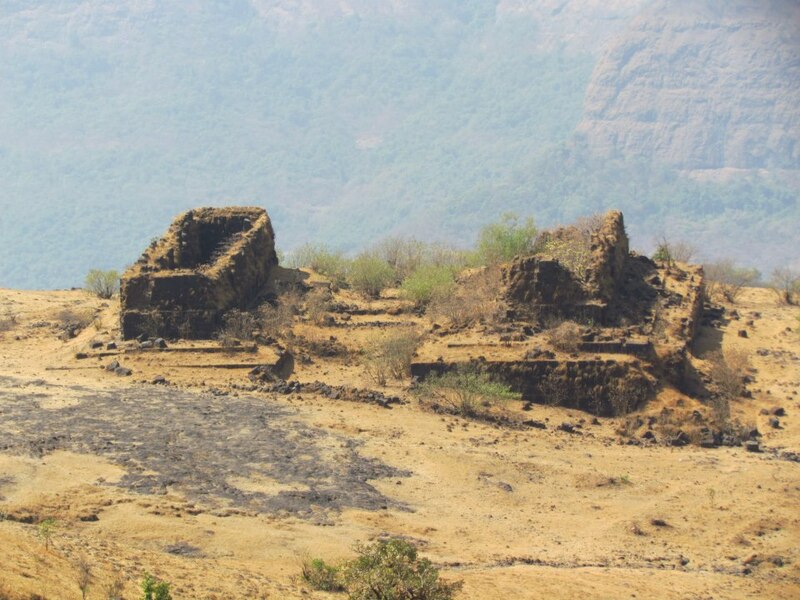 The fort was looted and destroyed by the British upon siege. I joined this overnight trek organized by my WTA friends and we were total 32 people attending the same. One positive thing while going with a large group is that you get to meet a lot of people of varied background and at the end of the trek, you form ever-lasting friendships! We left Pune around 6.45 PM in a private mini-bus. We reached to Mangaon via Tamhini Ghat and waited for an hour for our Mumbai group who were coming by public bus. 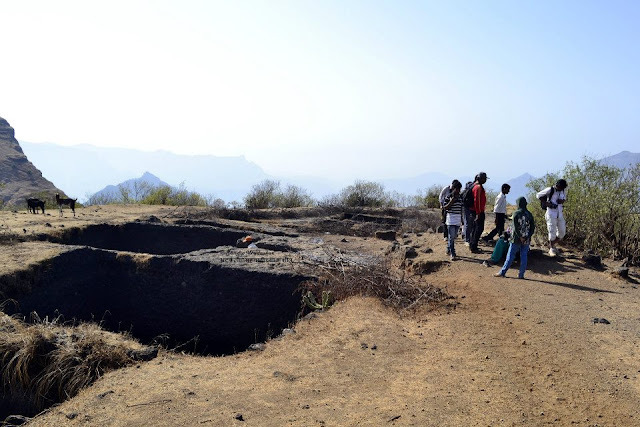 Initially our plan was to have dinner on top of Raigad but many of the group members had the fast next day and we decided to finish our dinner before 12 AM. As there was still some time left for our Mumbai group to join us, we finished our packed dinner in front of Mangoan bus stand. 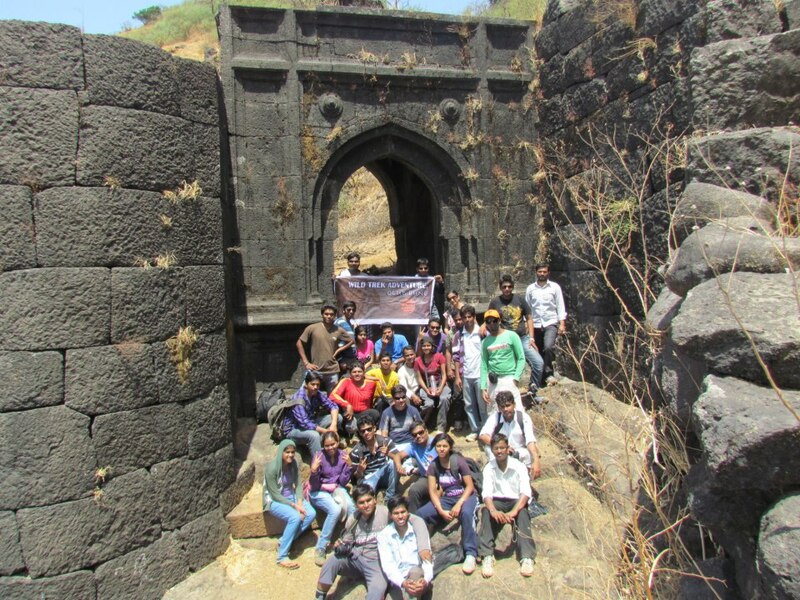 Finally our Mumbai group joined us and we left for Raigad. We reached at the base village Raigadwadi around 1 AM. We were behind schedule by almost 3 hours! 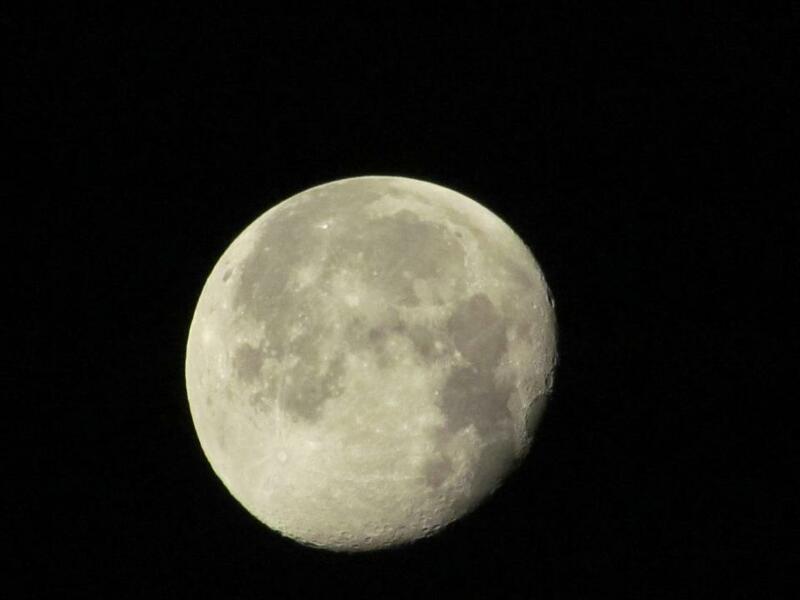 We started our trek around 1.15AM with gorgeous moon above and we did not need to switch on our torches or camera batteries even at once. 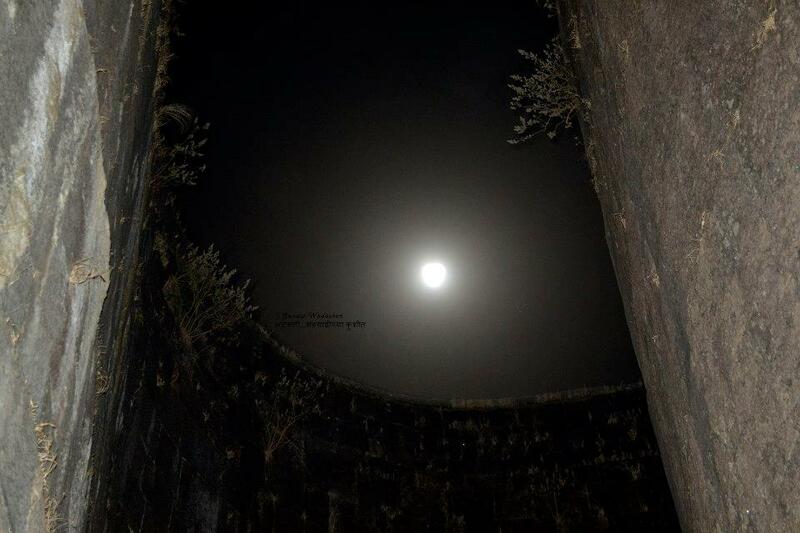 After walking for almost 1.15 hrs, we reached to Maha Darvaja (Main entrance of the fort) through which moon was looking radiant. Finally we reached on top of Raigad around 3 AM. As we wanted to get up early, we immediately went to sleep in front of the dormitory. As I had hard time in sleeping in front of the temple on Rohida trek earlier week, I was well prepared and had purchased a brand new Wildcraft sleeping bag so as to sleep comfortably. Unfortunately, though I had a cosy sleeping bag to sleep, there was hardly any time to sleep. I hardly slept for 2 hours and got up around 5.45AM. After finishing early morning chores, some of us reached to a place named “Holi cha Mal” to witness the sunrise. We spent 15-20 minutes there waiting for the sunrise but sun was not yet ready to come up. As we had to start early for fort exploration, some of the team members left for the breakfast. I was determined not to miss the sunrise and stayed back along with Prasanna for a while. Gradually sun rose gently from behind Torna fort and what a breathtaking sight that was! There is something wonderful about the photo shoot. You start noticing the things that you otherwise seldom notice. I was searching for some foreground objects to make sunrise appear more beautiful and I spotted a small tree to put it in the foreground. After the sunrise, I photographed the place named Holi Cha Mal - a wide open ground, used to celebrate annual Holi festival. In front of the Holi Cha Mal, there is a marketplace which is spacious and built on a high plinth. It is said that people used to shop on the horses during older days. 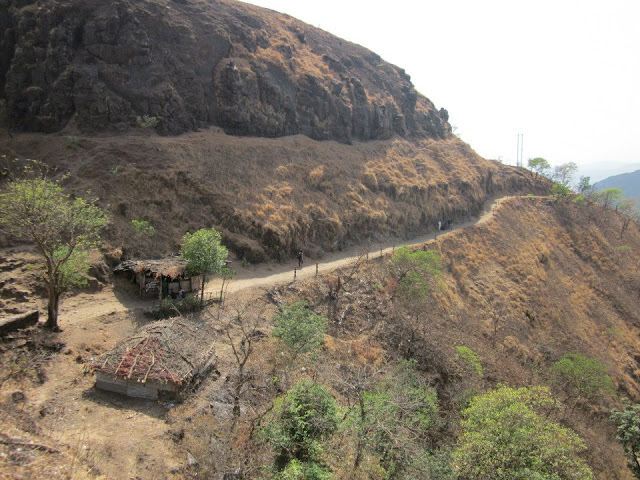 The road from here leads us to Jagdishwar Temple and Bhavani Tok. After the sunrise, we had a nice breakfast of Poha and Tea and then departed to visit different places on Raigad. As we had quite a large group, we divided ourselves in different groups. I was very eager to explore Raigad and went first along with Nikhil and 2 other members. Our first visiting spot was Bhavani Tok which is the farthest point on the East Side. You need to walk for half an hour to reach to Bhavani Tok. Pathway to Bhavani Tok was beautiful and we got stunning views of Sahyadri all around. We reached to Bhavani Tok soon. After that we proceeded to visit Bhavani Temple. Route to Bhavani Temple is dangerous. There is hardly 1-2 feet passage with almost straight deep valley on one side. We needed to be extra cautious with each and every step. 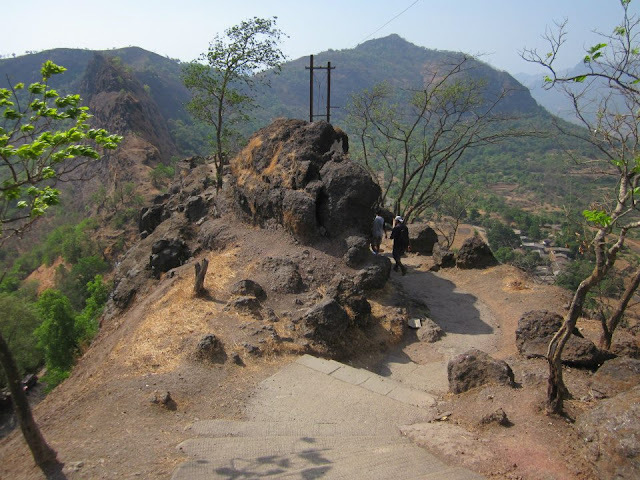 Finally, after overcoming the dangerous route, we reached to Bhavani Temple. 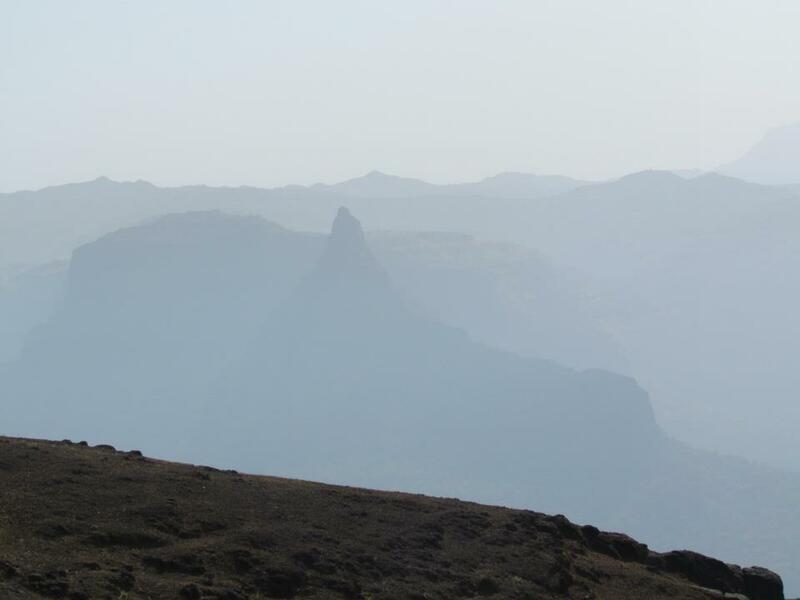 It was very serene with no one around and we just reveled at the marvelous sites of Sahydari. While returning back, we came across group led by Prasanna who were then visiting Takmak Temple. I cautioned them of the risky and narrow passage ahead and asked them to be extra vigilant. We waited for Prasanna and group for a while. It was becoming hotter and hotter and we wanted to have some respite from the scorching heat and we rested under a small tree and waited for Prasanna and group to join us. After a while, our next plan was to visit Barataki and Darugola Kothar which is on the North side. After a while, I wanted to spend some quiet moments in Jagdishwar Temple. So I went inside it and meditated for a while. After meditation, I chanted some mantras. Echoes of Mantras made the atmosphere in the temple very magical and I spent really some magical moments inside the temple. 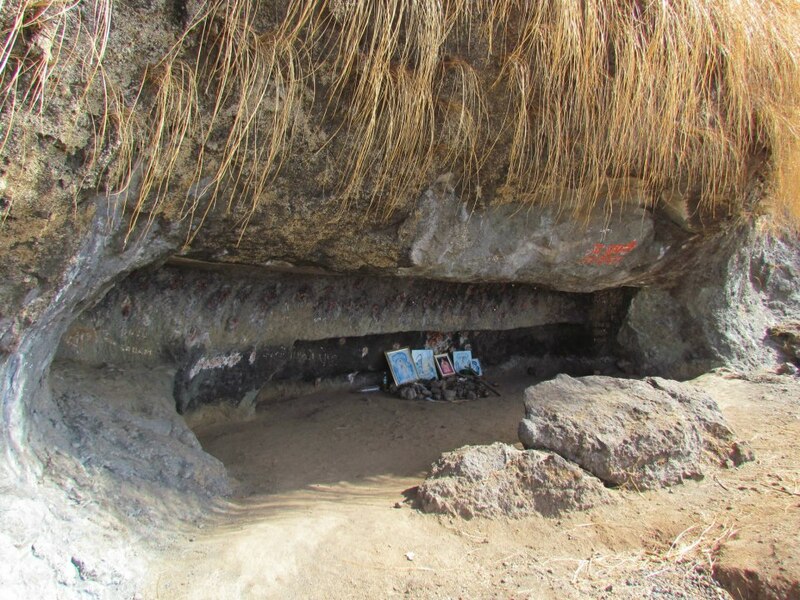 After coming out the temple, I visited Chatrapati Shivaji Maharaj Samadhi (tomb) and Vaghya Kutra Samadhi (tomb). As I was resting in front of the temple, I came across a group who had come via ropeway. They were eager to see Sinhagad from the top. I politely told them that Sinhagad was not visible from Raigad and instead showed them Lingana, Torna and Rajgad. They were pretty happy to gain this knowledge and thanked me for my expertize. Other members later joined me and we rested for a while in front of the temple. We had a nice cooler water in front of the Jagdishwar temple. Cool water tasted like heaven and our batteries were recharged once again. Our next destination was Takmak Tok which was used to execute proclaimed criminals. View from Takmak Tok was breathtaking and I got myself photographed by Sandip Wadaskar. 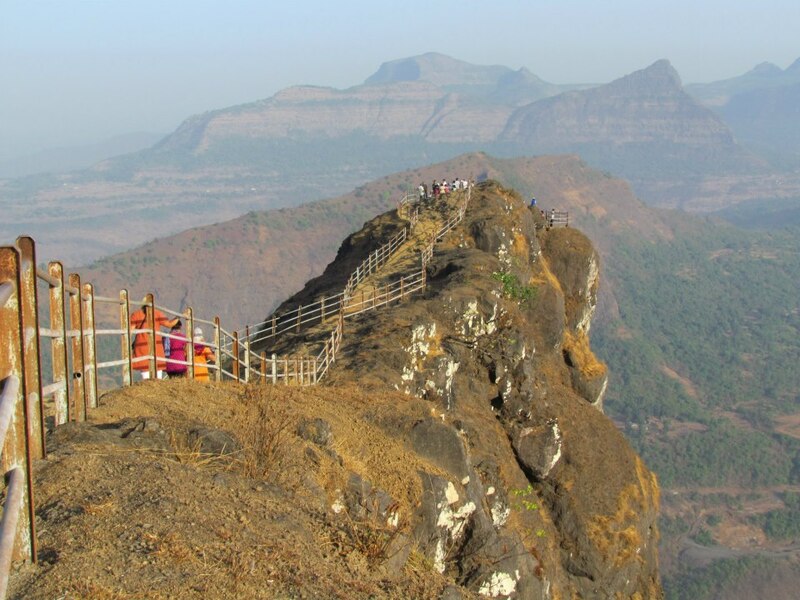 You can view Kal River Khore, steep clif of Raigad and Mahadarvaja from this location. While coming back, I came across 2 girls from our group sitting under a small hut. They were looking very uncomfortable and I enquired. One girl had developed blisters on her toes and other was dehydrated. I asked them not to bother about visiting more places and rest. After Takmak Tok, our next destination was Wagh Darvaja. 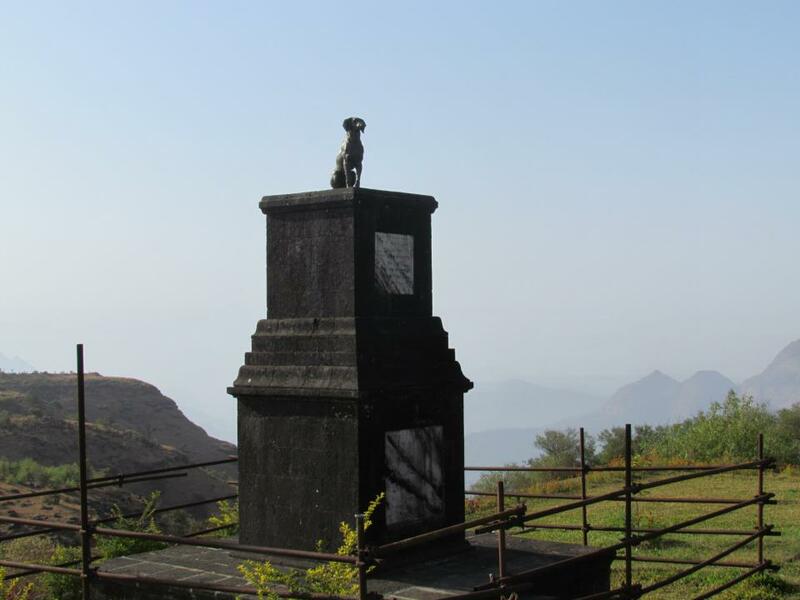 Along the way to Wagh Darvaja, there is a small Mahadev Temple. 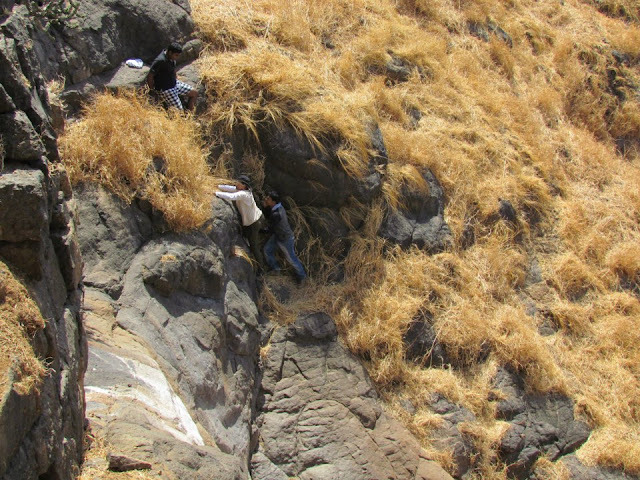 After passing Kushavart Talav, you need to follow a trail and descend for 15 minutes to reach to Wagh Darvaja.This is a secret door and is not visible from the top. If you look at it closely, there is absolutely no sign of any path going down from this gate. This was the very gate from which Chatrapati Rajaram had escaped when Raigad was surrounded by Mughal Knight "Zulfikar-khan" after the murder of Chatrapati Sambhaji Maharaj. 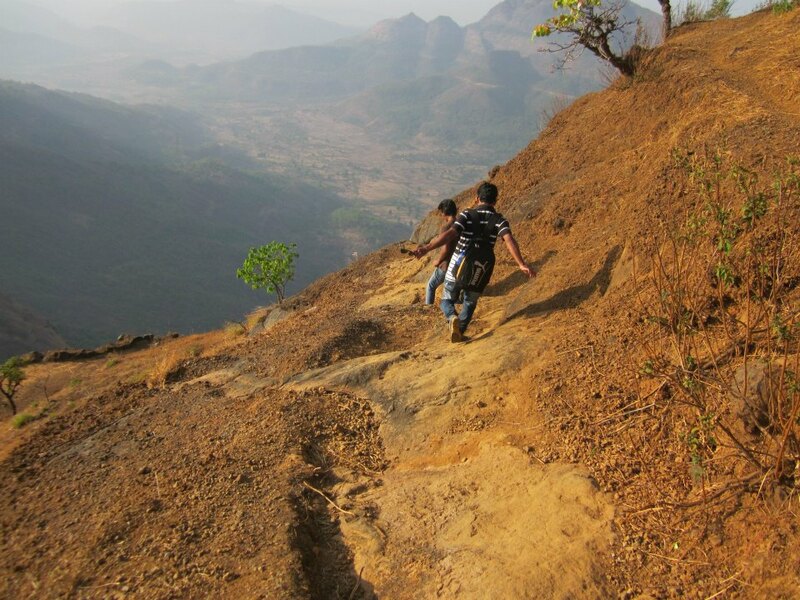 We met Prasad and group who had descended from the other risky route after viewing Barataki. We had a nice group photo captured in front of Wagh Darvaja. It was a steep climb while coming back to our place and sweltering heat made it worse. A simple looking trek was turning out to be a tough one because of the hot weather. Finally, we reached back to Holi cha Mal and rested for 15 minutes under a big tree. We enjoyed lemon juice, butter milk and Karvand to beat the heat. Prasad suggested a good place to rest for a while and we all followed him. We then went inside of one of the watch towers. 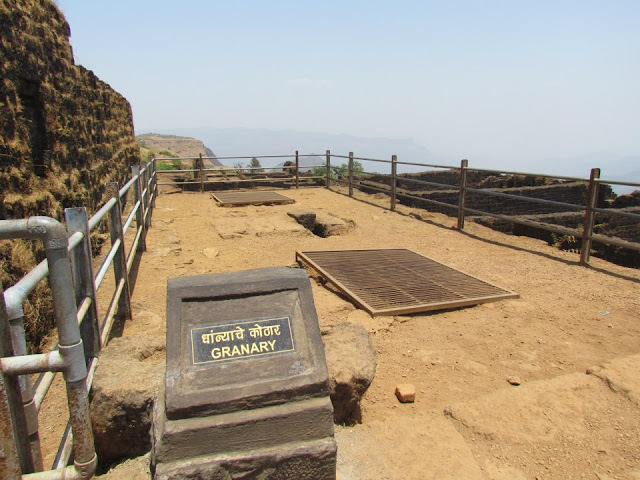 It is said that Sambhaji Maharaj used to rest at this place watching Gangasagar lake and Kokandiva Fort. Air was very refreshing and we had quite a relaxing time resting at this place. Finally, we proceeded to visit Rajmahal, Nagarkhana and Rajyasabha. Remnants of Raj-Mahal: This Raj-mahal hosts Ranivas - Queen's Palace, Ashtpradhan Niwas - Minister's Quarters, Dhanya Kothar - Grains Warehouse. Dhanya Kothar - Grains Warehouse. Nagarkhana - Excellent example of architecture and miraculous acoustics. The distance between Nagarkhana and Royal throne is almost more than 200 ft; still any small whisper can be heard very clearly from both ends. We experienced the same when we asked couple of guys to whisper from Nagarkhana and rest of us heard their whispers clearly while standing in front of the throne! After visiting all of the above locations, we had a nice lunch at Deshmukh Food Joint on top of Raigad. Boy, we were all really hungry! You realize what hunger is once you push your limits. We rested for 10 minutes before we started descending. As it was becoming hotter and hotter, few members who had problems with the heat, preferred to come down via Ropeway. Rest of us started descending via steps. I wanted to click few photos of places I missed while trekking at night. So I took my own time to climb down. Maha-darvaja: It is built in such a way that the fort will stay protected from enemy's attack with the help of elephant. A curvy and narrow way prevents elephant to get inside the fort. It was becoming hotter and hotter with absolutely no breeze. Along the way, we had plenty of water which had also become lukewarm. These were tough and challenging moments. Finally, we made it at the base. From the base, I clicked the Khoob Ladha Buruj - a strategically located tower, from where any attack from both the sides could be defended. Sandip and Co. were already down and chose a road under the shadow to take a well-deserved rest. 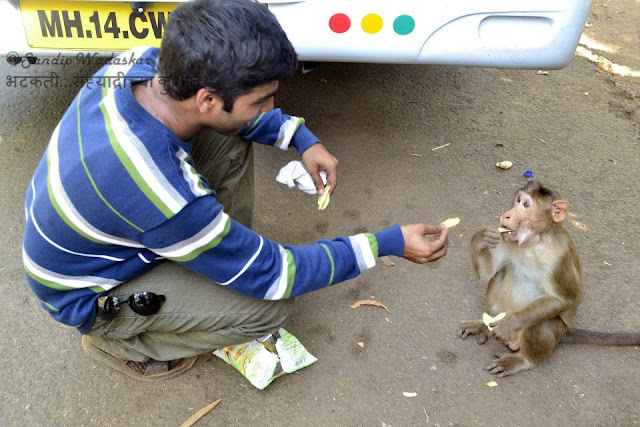 Rupesh showed his love for monkeys and fed chips to a monkey. Thanks to Sandip for capturing this unforgettable moment! Finally, all came down one by one and we were ready to depart. Our cosy bus was waiting for us to take us back to Pune. We reached safely to Pune around 10.30 PM while enjoying scenes from the Varandha Ghat along the way. I reached home around 11 PM, had a light dinner and slept peacefully to get ready for the office next day! 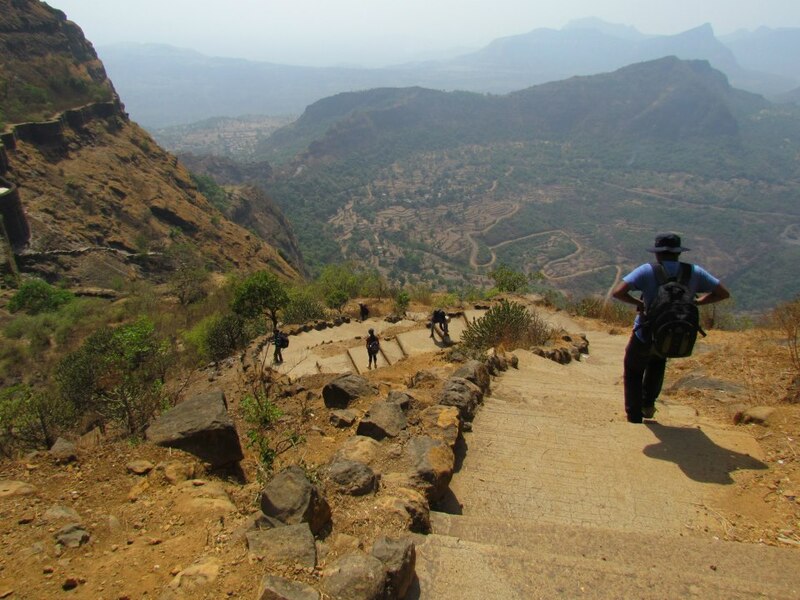 In summary, this trek provided us the contrasting experiences -- trekking under the soothing moonlight as well as scorching sun. But sheer satisfaction of witnessing mesmerising sunrise followed by visiting rarely visited spots made it a worthwhile and rewarding experience. Keep it up dear....ata Thambu nako...ekhadya dongrawar bhetu..
Add historical facts to make it perfect like bhavani talwar gifted to maharaj at bhavani temple by deity herself .water of 12 rivers was poured in gangasagar lake at the time of incarnation of the great chatrapati shivaji maharaj .photos are of good quality well done keep it up! Keep writing and keep exploring new places !!!!!! !